Moving on from hosting comparison guides like BigRock vs GoDaddy and BigRock vs HostGator India, today lets take a look at the importance of professional email addresses, actionable tips to make one and how to create a professional email id using BigRock. Everything that is customized leaves a lasting impression. A professional customized email also does the same. When you set up a business, it is important to have your own company email address. The address that you print on your visiting card should make a direct impact on your potential customer. The website you make should feature an email address of your own. A professional email id helps to build loyalty with clients. It helps in better marketing and promotion. It can help to filter the spam quality as well. You can use Gmail or Hotmail as your business email address. But, that will not give a professional feel to your client. A professional email address is the need of the hour in this digitally customized age, especially to survive the competition. In fact, professional email ids can be a major decisive factor for your business. How To Create A Professional Email Id? Learn how to create a professional email id with the help of this quick guide. Creating a business email should be simple and unique. From domain acceptance to customized names and professional email address examples this guide covers all this and more. In addition, it also includes simple tips for creating a professional email address that’ll enable you to make an impact on your business. You need to set up your email address with a credible domain service provider. If you have your own business domain, then the email address will be included in the domain package. Many other credible domain service provider like BigRock let you customize your email address according to your profession. It also provides you with BigRock coupons for varied hosting, domain and other products. A professional email linked with the credible domain will help you to market your business well. Also, by selecting a good domain name, you’ll be able to create a professional email that is appealing and creates a good impact. Short for Internet Service Provider, it is important to never use an ISP address for businesses purposes. Using your service provider’s service domain email for your professional email id can affect your business. Moreover, what will you do if you change your service provider in the future? Your professional mail id should be permanent. You can’t keep changing your email ID from time-to-time. This will majorly affect your revenue. A custom domain is a better bet for a professional email. You can also replace your ISP email with a professional email address if you already have one. Proper email format sets the tone for your professional email address. Don’t use numbers in your professional email. Don’t make your company email address too long because no one remembers long emails. Avoid using personal names or nicknames. Don’t use fancy names for your professional email address. The more concise your approach, the better results you can expect for your business. Always incorporate your company name in your email. Also, do not use dot to separate the email address. Keep standard formats for different needs. For inquiry or a quick reply, always keep the format such as hello@yourdomain.com. For public relations, you can keep press@yourdomain.com. Individual employee address can also be created in a similar format like yourname@yourdomain.com. This naming conventions make your work easier. Simple setup of emails in this format can also help you with sorting. With standard formats, there is no confusion as well. A professional email address needs more security. Create secure passwords and better spam filters for your email address. This will prevent hacking and spam activities. If you get a professional email ID through a hosting company, then they ensure spam filters. But, it’s important that you create your own security features for your professional mail ID. Phishing attacks have become common these days, so added security is always an advantage. You can also secure your domain or email through anti-virus software that is available. This is another factor in setting up a professional email ID. Don’t indicate a position (ceo, cfo) or your profession whilst setting up a professional email. You need to keep it simple according to your business. Complicating your email will not make your job easier. Imagination for creating a username for email can be endless. But, the idea is to create an impact on the person or client and that should play out well. Don’t create a professional email based on your religion or race. This will be a major turn off for your potential clients. Don’t use personal character or gender. Gender should always be addressed in your email signature and not a username. These small things make a difference in your professional mail ID. Always have a flexible approach when making your professional email ID. If the username you want is already taken, you can combine your name and company name for a different email. You can also search for an email name through online name generator tools like Name Generator, Spinxo or Best Username Generator. These tools offer the best professional email address suggestions. Use a template for your professional email ID if you need to send similar emails. A template also helps to create automatic reply so this actually saves your time. You can customize your email or fill in automatic fields in the message. The templates also help to prevent mistakes in the email and help put off the task for later. Never use free professional email options for your business needs. Most people use Gmail (yourname@gmail.com) or Outlook for professional emails. This doesn’t create an impact. Thus, it is better to opt for business emails that most hosting companies provide as it comes with customization options. For your website, it’s important to use a special email ID that corresponds to your brand or image. You need to choose an email that goes well with your site name. Having a personal email in the contact page will be a turn-off. Create a separate business ID for your website. You can also choose from a host of companies that offer you free ID with complete website package. A professional email should pay special emphasis on branding. A brand name created through email also reaches potential clients. You can choose a customer email address or opt for hosting services that offer email through branding. Services like Constant Contact and MailChimp can help in right branding for your professional email. Your professional email ID should pay special heed to customer service support. The first thing people do when they know about your brand is to send a query. A professional customer service email will reach the right people. Again, you can keep this simple (support@yourdomain.com) or add customized options in these emails. This is another rule to follow if you are in a creative profession. A profile picture or a signature helps to add credibility to your name. Your potential clients will also be able to see your name so this is actually an advantage. Before setting up your own professional email, you can look through various options. Online professional email address examples can help you determine the right kind of email setup you are looking for. These examples kind of give you a fair idea of professional email IDS. BigRock offers basic hosting of up to 5 emails with all their Starter hosting packages. For unlimited emails option, you can choose a higher hosting plan. Or better yet, opt for BigRock’s Business Email or Enterprise email option. BigRock provides storage for mail accounts ranging from 500MB to 5GB. It also offers in-built spam/virus protection. You can set up different features for your professional email account like mail forwarding and also link your host account with Gmail. Furthermore, you can instantly start using your professional email once the verification is done through code. Read this BigRock Review to learn more about this hosting service provider. To set up email using BigRock, you need to have a hosting account on BigRock. You can use these BigRock hosting coupons to get a discount while purchasing a web hosting. You’ll also need a domain name or you can transfer your existing domain to BigRock. 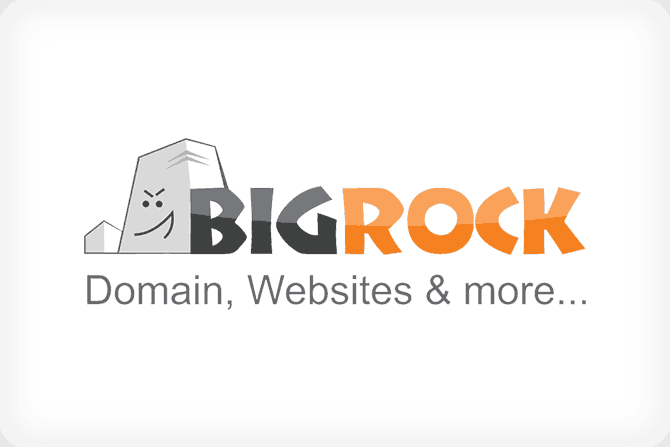 For purchasing a domain, use BigRock domain coupon code. Once you have registered, you need to, first, change the Name Servers of your domain name. For this, you can refer to this comprehensive guide on how to change Domain Name Servers at Bigrock. Following the change in Name Servers, you can undertake the below steps to create your professional email address. Step 1 : Visit BigRock.in and on the top right-hand corner, you’ll see the Login/Sign up icon. Click on it to log into BigRock Control Panel (cPanel). Step 3 : Type in the name in the Email box. If this is the first email you are creating, you can create one with yourname@yourdomain.com or hello@yourdomain.com. Next, set a password. Ensure that it is strong. If you need help, use a password generator tool such as LastPass. You also need to set the Mailbox Quota (storage). Lastly, click on “Create Account” and that’s it. You have successfully created your first business email address! A professional email ID is a reflection of your work or company. Be it for your small business or your profession, having a professional email address is mandatory. The company email address should match your brand image and attract your customer base. A professional email ID lets you communicate in a much open way with your customers’ through feedback and orders. It can also help in the promotion of your brand. Create a professional email address that is permanent as a business email is important in professional communication with your clients. You can choose unlimited options but it should create the right impact on your business clients. Do you have a professional email ID? If you don’t, its time you make one. 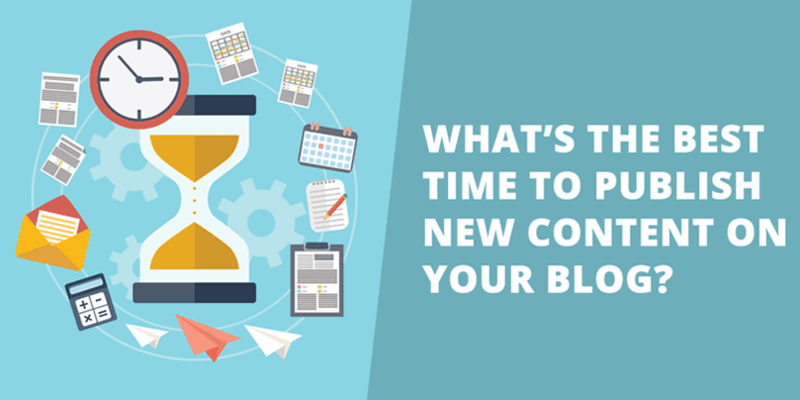 What’s The Best Time To Publish New Content On Your Blog?